Last month I had the very enjoyable experience of having a suit “made to measure”. It was not more expensive than a (good) retail suit and I needed a new suit.., I couldn’t really find my style, and one thing led to another and I ended up at Café Costume in Brussels. They work solely via appointment, I was the only client in the store. And after an hour and a half, filled with attention and an astonishing amount of detail, I left with the best fitting suit I can afford and perfectly suited (pun intended) to my style and personal wishes. I can safely say that the odds of somebody walking around in exactly the same suit are astronomical.., no self respecting gambling man would take that bet. 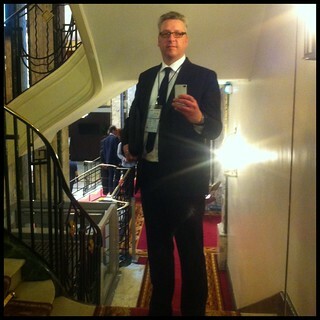 Social Media, or any derivative thereof.., has to be made to measure, too just like my suit. Granted, I could have bought a suit of the rack, easily. But it would not have reflected me, my personality, my style. Nor would it have fit as nicely and it would most definitely not have looked this good (right?). The initial price is about the same.., unless you’d go to a really expensive store.., and depending on the fabric and other choices I could have doubled the price of the suit. But I didn’t need that.., I needed a suit that fitted me. The same goes for Social Media (be that external or internal). You can buy something out of the box, but it probably won’t suit your needs. You can hire somebody who claims they’ve done it all, and they can just repeat what they’ve done before, but it probably won’t fit your culture. You can download a strategy, a plan that worked before, a copy paste approach, but that probably would not convince your CEO (or it shouldn’t). It might work.., for a while. It might yield some (short term) benefits and it just might be worth the effort (but probably not). What is you industry like? What are the legal consequences or pitfalls? Is it B2B or B2C, or both? How does your customer care perform? How big is your company, does it have offices abroad (and how do you communicate with them)? What is your current marketing and communication strategy? How broad do you want to implement social media/communication? Where are your suppliers (virtually) and how do they communicate? Are we strictly talking outward communication? Or do you want to shake things up internally too (which you should)? Who is currently active within the company on Social Media? Are there any rogue company channels out there? And how well are they doing? As you can see, there are quite a few things to consider before jumping on the train. And the more questions we ask, the better the understanding of the company.., the better the fit. Whether you start out on a social media marketing adventure, rewire you customer care or go for a full fledged Social Enterprise solution.., you have to create a custom fit. It always start by listening and observing and finding out where and what the pressure points are. It’s about solving problems, not about buying solutions. You’re welcome David. Thanks for stopping by.., and thanks for the compliment on the suit.., I do love it. Totally worth it.